Motorbike Tour to Himalayan landscape Tibet is adventure and most challenging motorbike tour. Tour start from Kathmandu Nepal, ride to Lhasa through friendship highway of about 1000 kilometers. Cross typical Tibetan villages and small cities. Zhangmu, Nyalam, Lhatse, Gyantse and Shigatse via beautiful Yamdrok Lake. The sightseeing with your bikes to Potala palace, Jokhang temple, Norbulinka palace, Drepung monastery in Lhasa. Second largest monastery Tashilampo in Shigatse, famous Gyantse Dzong and Palkhor monastery in Gyantse, oldest Ronbuk monastery near Everest base camp is the major visit. Ride to Everest Base Camp on your way back. The highway from Lhasa Kathmandu goes through four major high passes which are over 5000 miters. Get our prefect itinerary of Lhasa Kathmandu Motorbike Tour which is starting and ending at Kathmandu Nepal. 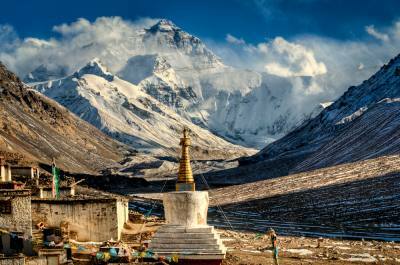 Tibet Kailash Travel can customize itinerary as per your interest. The best season for this tour is from April to November. A representative from Tibet Kailash Travel pick up from international airport and transfer to the hotel. If time permits talk about tour and preparation. After breakfast in Hotel, start riding with your motorbike in Kathmandu valley. Cover historical paces of Kathmandu. Pashupatinath, Swoyambhunath Stupa and Kathmandu durbar squire. come back to hotel and final preparation of your tour. meet your guide, mechanic. After breakfast in hotel, start ride with your motorbike towards Tibet. it is 114 kilometer riding at Nepal part which is through scenic narrow road but paved till Nepal Tibet boarder Kodari. cross immigration and reach at Tibet site. meet Tibetan guide and driver. continue ride to Nyalam, the first Tibetan town. We take a full day acclimatization in Nyalam. Take a short hiking to hill side of Nyalam with guide. Latter ride with your motorbike to Milereppa cave and surround. It is short riding today to make your body acclimatize at high land. 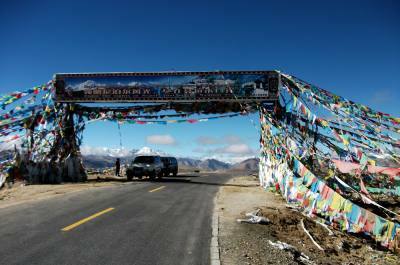 The riding is pleasant, you will be passing 5,220 meters Gyatso La pass. continue riding down to the fertile valley of Lhatse. About 10 km west of Lhatse town, there is a small Gelugpa monastery we can ride and visit. A typical day riding between the second large city Shigatse. The ride today is across Yulung La (4950 metres), over fairly unpaved roads in the plateau area. After reaching Shigatse, we will transfer you in a better hotel and relax. If interested, you can visit the "Tashilhumpo Monastery", a vast monastery with its own streets, housing sectors, plazas, back alleys and complex of temples and halls. It is short riding today but we have option to ride via small and picturesque village of Kardoi from Gyantse which make our trip total 120 kilometers. Riding road through intensely agricultural, cultivated areas. Much of the gravel road is lined with poplar trees, which are a distinctly Tibetan feature. Visit Kumbum and Palcho Chode monastery in Gyantse. You will get comfortable hotel to stay overnight here too. After your breakfast start to visit major places in Lhasa city with your motorbike. 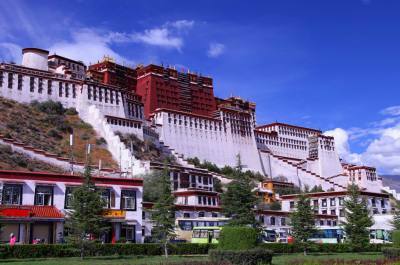 The Potala Palace: Winter palace of Dalai lama considering of 13 stories and 1000 rooms. Drepung Monastery: the biggest and the richest of all the monasteries in Tibet. School of over 10000 monks and governed 7700 subsidiary monasteries. Bharkhor Bazaar: largest and oldest market in Tibet. You walk through the heart of old Lhasa with its narrow streets white- washed stone homes, windows framed in black and brightly painted woodwork and almost everyone has something to sell. After your breakfast, start to visit Sera Monastery: Situated to the north of Central Lhasa, it is Tibet’s the second largest monastery. Jokhang Temple: Situated in the heart of old Lhasa, it is the most sacred and oldest temple in Lhasa. Norbulinkha Palace: The “Jewel Park” as it is known in Tibetan, was built in the 18th century by 7th Dalai Lama and served as the summer palace of the 13th and 14th Dalai Lamas. back to hotel for overnight. After breakfast, ride to Tingri. The gateway town towards Everest Base Camp Tibet. Visiting Sakya monastery there. One of the very famous monasteries in Tibet, and we also cross the highest pass called Gyatso La (5200m) on the way riding to Tingri, the entrance of Himalayan Nature Reserve. option to ride Xegar today. Ride to Rongbuk monastery through new winding road in the mountains. Enjoy the stunning mountain scenery; past the wild grassland, the torrent and soaring mountains. You can see the panorama of Himalaya range including the four over 8000m high mountains and more to enjoy like Mt. Lhotse (8516m), Mt. Everest (8848m), Mt. Qowowuyag (8201m) and Mt Makalu (8463m). Further ride to Everest Base camp and explore. Ride back to Ronbuk from where you ccan view majestic view of golden summit of Mt. Everest at sunset. Today a long ride to Nyalam following the Northwest direction ascending via Lalung La (5120 meters) and Thong La pass. The decorative passes are with beautiful with Tibetan Buddhist prayer flags. Here, we would see the northern front of the great Himalayan range. A wall of spectacular snow clad giants on the Nepal side of the border. Stay at a guest house in Nyalam. Early in the morning, ride to Nepal Tibet immigration and cross the border. Ride back to Kathmandu visa River bank of Bhote Koshi, Dhulikhel and other small villages. Get back to Kathmandu and check in your Hotel. Today is the day of final departure. We manage to drive you international airport. it is important to reach at airport before 3 hours from your original flight time. Accommodation in 3 star hotels on twin sharing in Kathmandu, Lhasa, Shigatse, Gyantse and in Lhatse. Rest of the places local guest houses. You can choose basic hotels to stay which decrease your tour cost or upgrade you accommodation to 4 or 5 star hotels in Kathmandu and in Lhasa. As per itienrary, only breakfast is in package at the time of you are staying in Hotel and guest houses. There are plenty of restaurants for your Lunch and Dinner. Guide will suggest you the goods one every where. Restaurants in Tingri or Xegar, Ronbuk and in Nyalam is simple provide Chinese and Tibetan style foods. Good toilet facilities during your stay inside Hotel, But simple common use toilets facility in Ronbuk, Tingri and in Nyalam. Motorbike Tour in Tibet is adventure trip in the high himalayan land. In case of emergency evacuation, we support as maximum we can by choosing best option. all the expenses for it comes to clients personally. Acclimatization in this tour have enogh as we stay 2 nights in Nyalam at first and riding shortly to Lhasate, Shigatse and Gyantse before reaching atLhasa, which help to get adjust your body in high altitude.